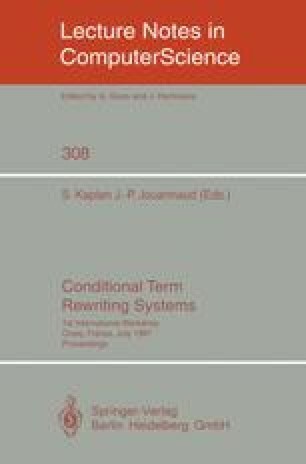 An architecture is presented for conditional term rewriting systems, which has been used to implement an interpreter for the Axis algebraic specification language — developed at the above laboratories. The design has been specified in Axis itself. The interpreter admits commutative, associative and associative-commutative operators in addition to those whose theories are defined by rewrite rules. The pattern matching algorithm is partitioned by equational theories, and additional theories may be added with no change to existing ones. A method has been developed for incorporating ‘built-in’ sorts and operations, which is completely transparent to the user of the system. This gives a significant increase in efficiency for sorts such as the natural numbers, and it has also allowed inclusion of a built-in sort identifier in the Axis language.